There is a saying that goes “I’ve saved the best for last“. 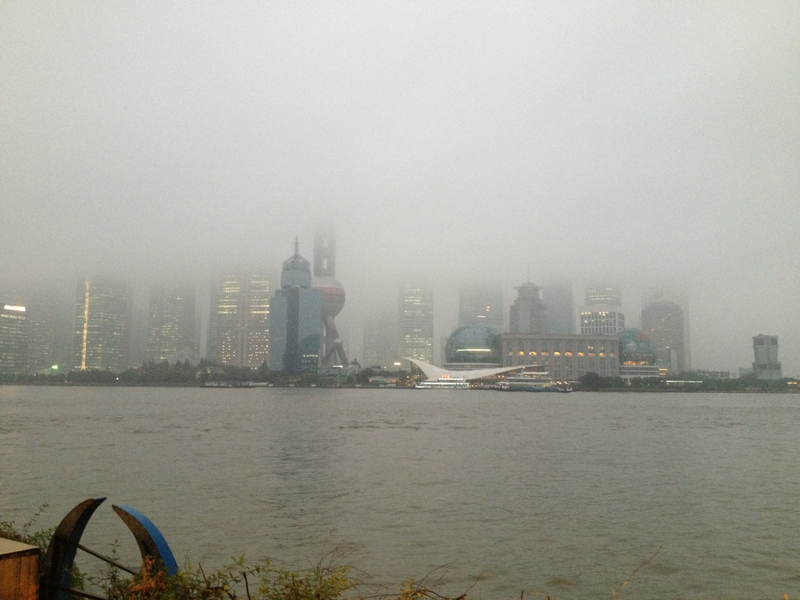 In my series on Shanghai ‘hoods, the last one is Pudong. But in my opinion, I’m not so sure it is the best. It is by far, the newest and most modern part of Shanghai and at night, the lights are so spectacular and out of this world, that it is hard to not believe that this Disneylandish looking place would be so strange. But that is how I felt. During the day, it was a disappointing place that reminded me of a scene out of the troubling, futuristic Hollywood movie “Inception”. I’m not sure if it was the smoggy, gray clouds that made this place feel so eerie or the complete lack of human population walking on the streets. But it felt just plain old creepy to me. Like a ghost town. I definitely shouldn’t have gone on a weekend! I’m certain the entire place would have been different during the work week. 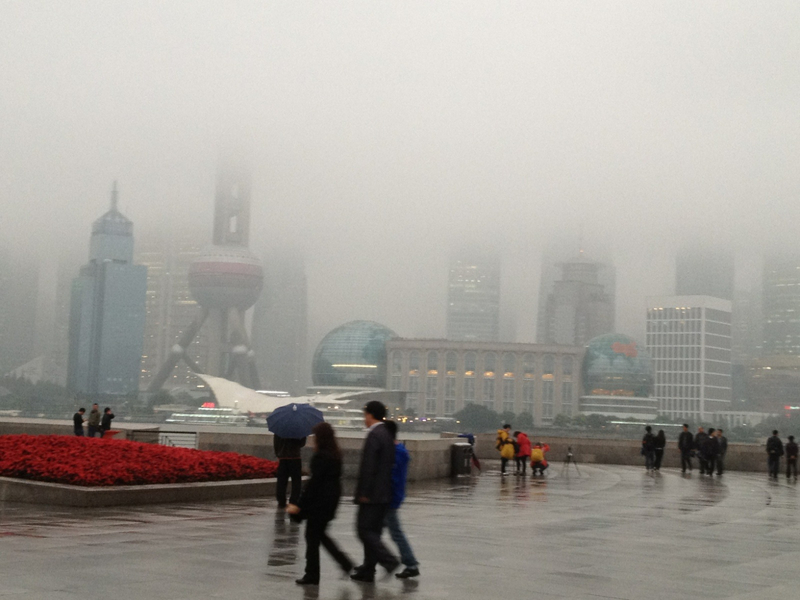 But still….to me it felt like a strange, futuristic place that instantly reminded me of where China is headed. 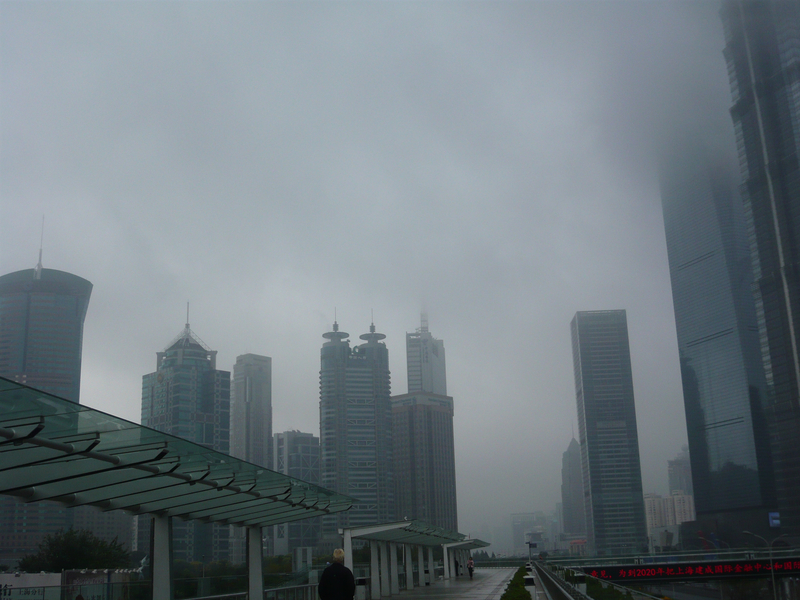 Only twenty-five years ago, the area that makes up Pudong was a barren, marshy farmland. There were no buildings, relatively few people and not much else exciting. Instead, all the life and blood of Shanghai was located on the other side of the river, in the Bund and the other vibrant neighborhoods stretching out from there. 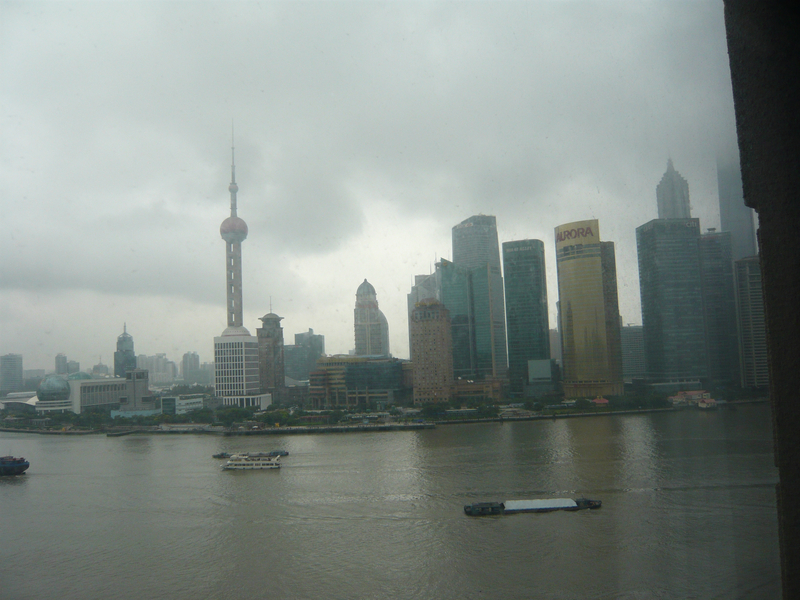 Fast forward twenty-five years and Pudong is arguably one of the most beautiful, modern skylines in the world. It is incredibly lovely and startlingly beautiful at night, when it is completely aglow in colorful lights (to see more of Pudong at night, click on post titled : Shanghai Surprise). 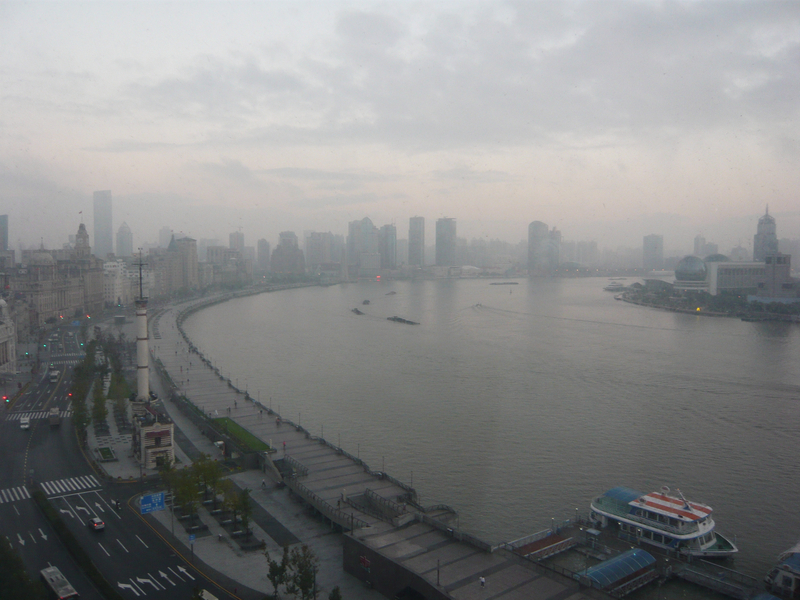 I had stared at it longingly from across the river, out of my hotel room in The Bund and across the boardwalk along the riverfront. It looked so surreal and so spectacular. I could hardly wait to check it out. 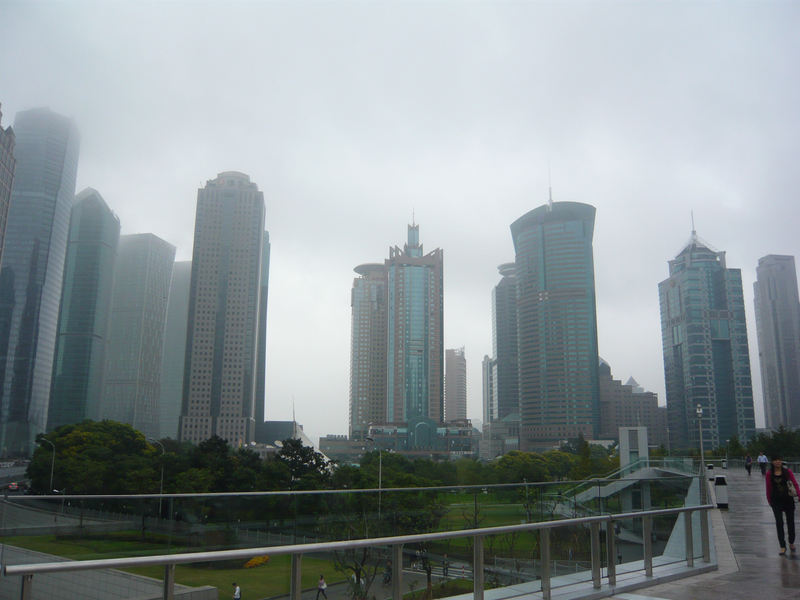 But unfortunately the only time left we had to visit Pudong was a Saturday morning and the place was empty. There was hardly a soul along the modern streets and the typical humid, smoggy weather covered the peaks of the tallest buildings in an air of mystique and question leaving me wondering if this misty fog represented the future of China herself: Uncertain and unclear. See for yourself and let me know your thoughts. 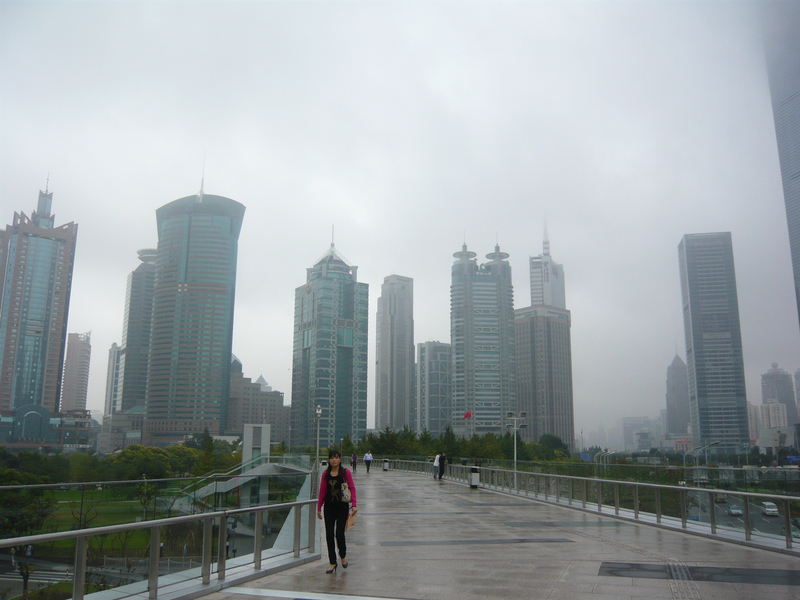 Come with me through Shanghai’s newest ‘hood, Pudong. P.S. I’ll save the Bund sightseeing tour for another post. This crazy underwater light show deserves a post in itself. Room with a view. 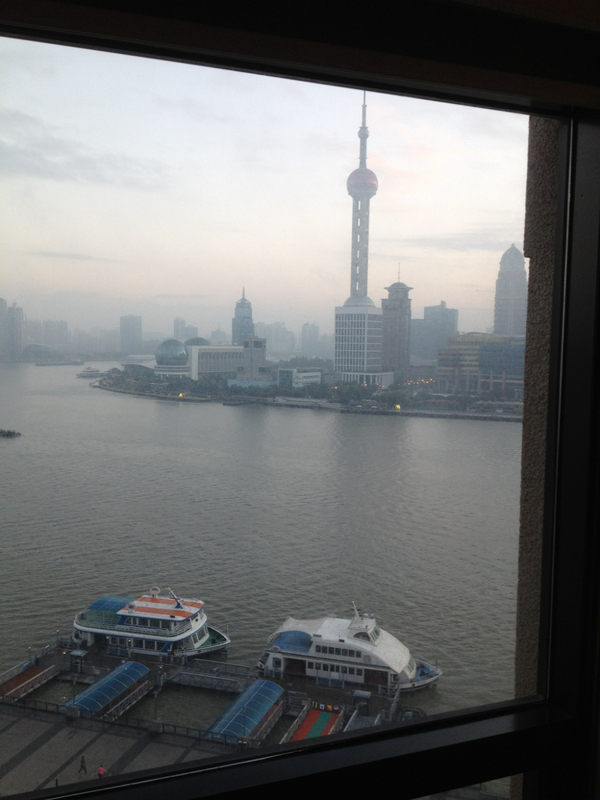 Our room overlooked the magnificent Bund on the left and Pudong on the right. 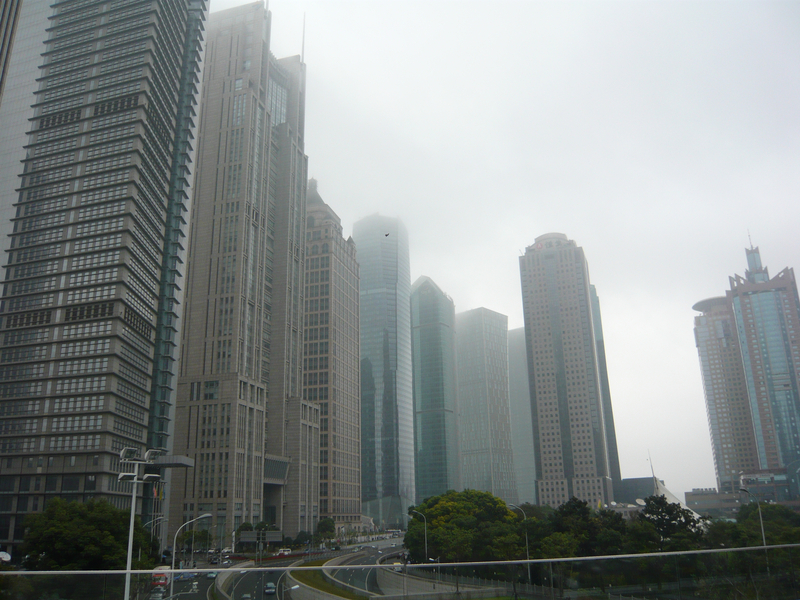 Unfortunately every single day we were in Shanghai looked like this one….gray, smoggy and humid. I could hear the tug boats calling at all hours of the night. They were constantly coming in and out of the waterways transporting the goods that keep China afloat. 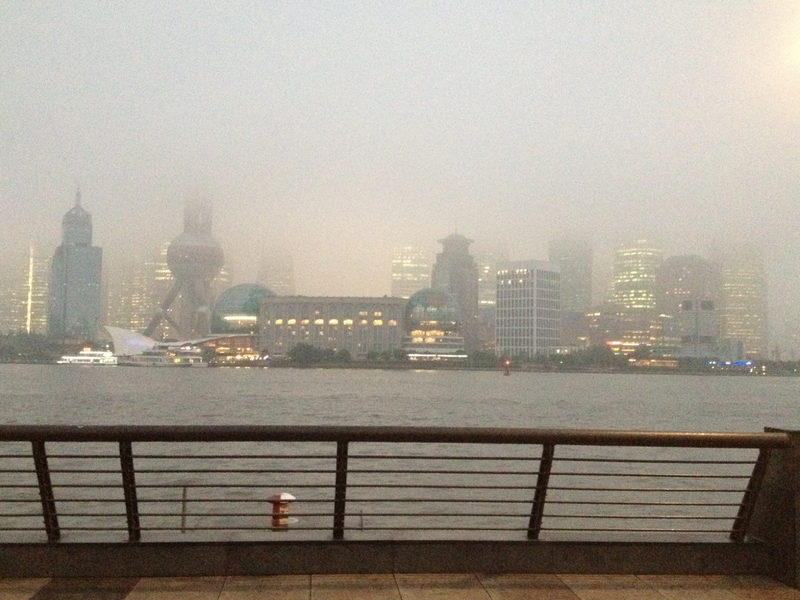 A typical misty day along the boardwalk looking across the way at Shanghai during late afternoon. I never was able to see the tops of the buildings as they were always covered in some degree and level of fog. 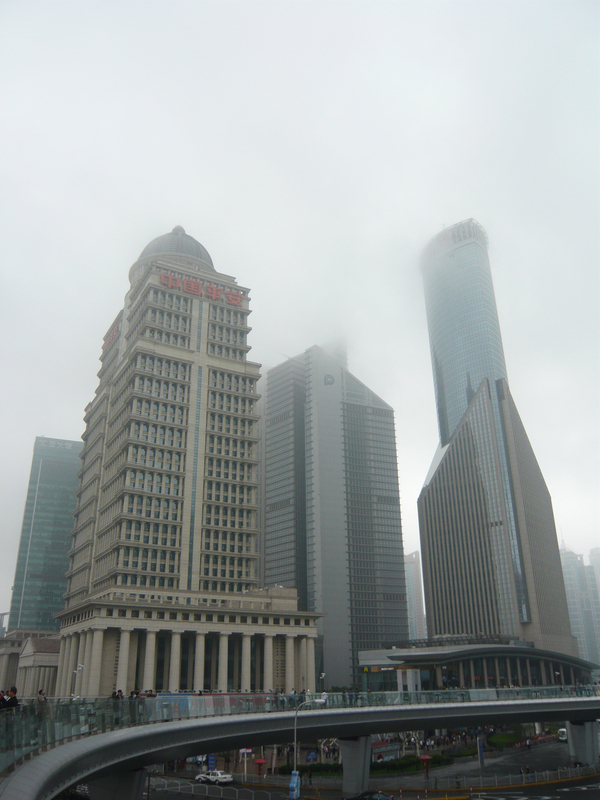 We walked across the waterfront and climbed aboard the infamous Bund Sightseeing Tunnel. It was perhaps the stupidest thing I’d ever actually paid money to ride! But I’m sure the kids would have enjoyed it. 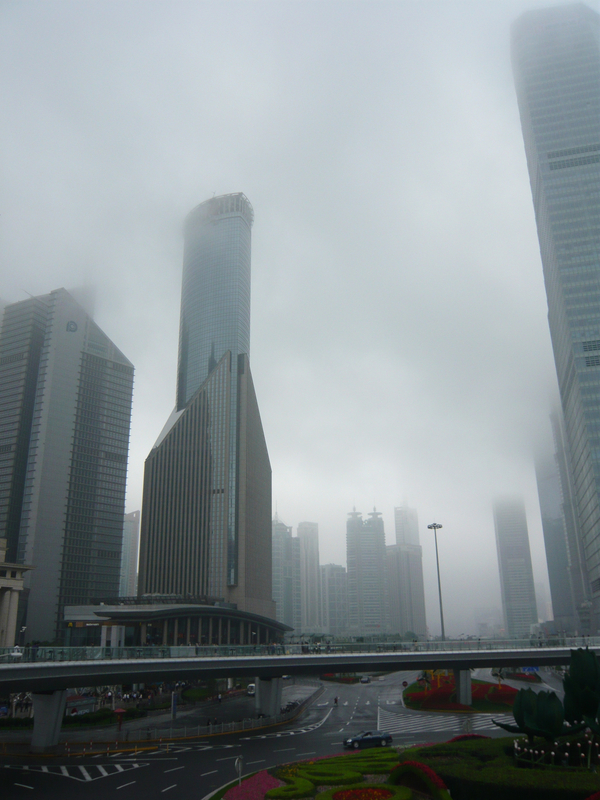 Then, we stepped out of the nightmarish Disney-ride for adults and entered Pudong, engulfed in fog. 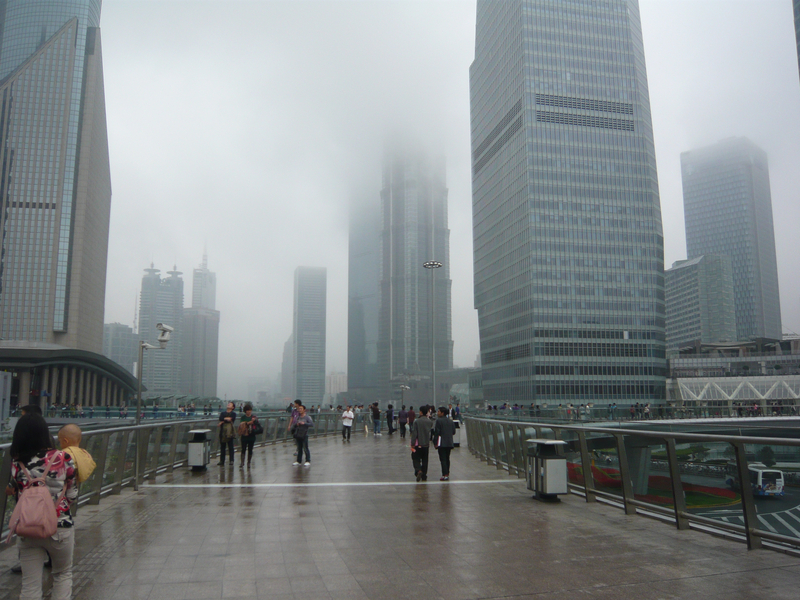 Once again, the ones who built Pudong did it right and included huge, above-ground sidewalks for the pedestrians. There are plenty of tall, impressive buildings as far as the eye can see. But during the foggy, empty daylight it felt lonely, desolate and detached. 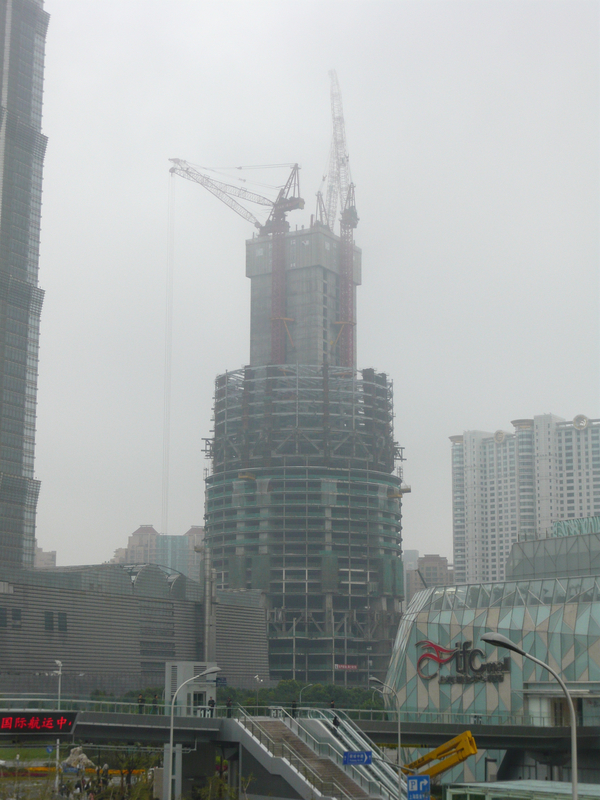 Apparently, this building going up is going to be the tallest building in the world when it is completed. Like anything Chinese, the exact height is being kept hush hush. How dare anyone find out the true height and try to build one higher! 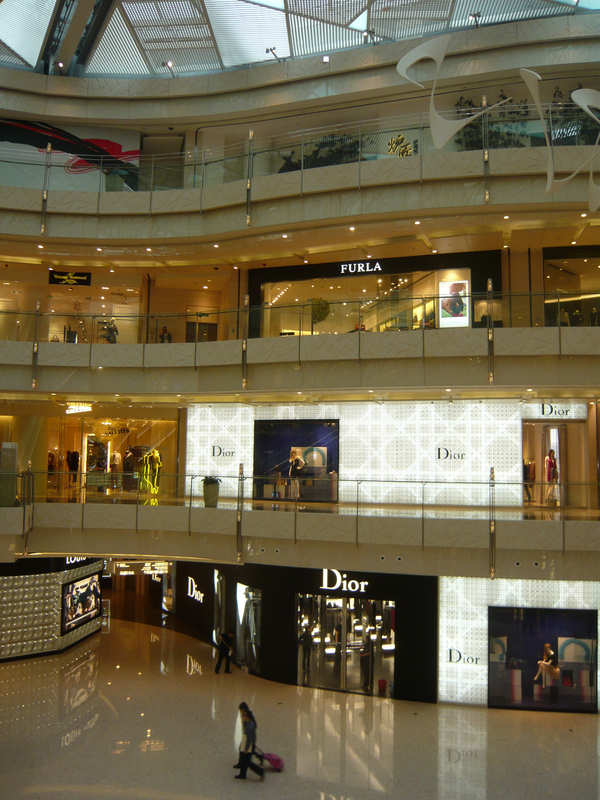 Along with the modern skyscrapers, there are also plenty of upscale shopping malls like this one we entered. Again, there was hardly a soul around and the place was empty. Given the price of the goods in these stores, we didn’t stay long. 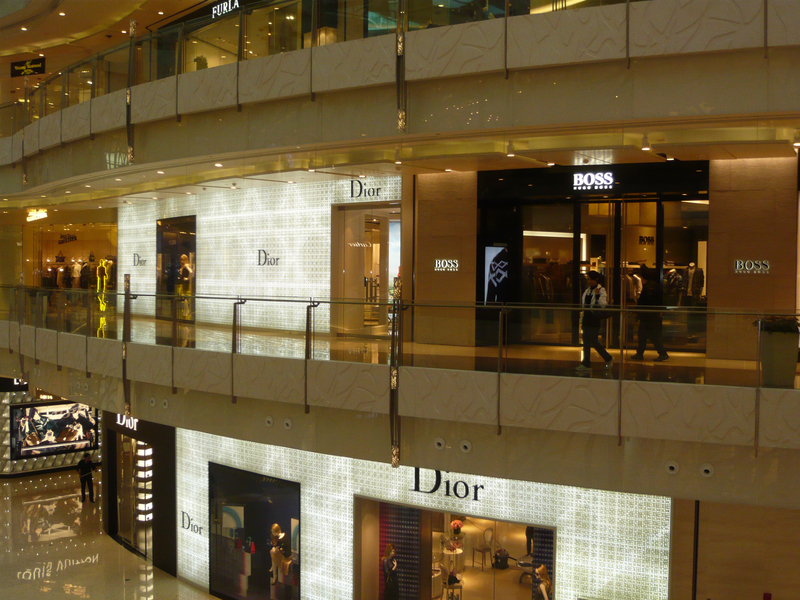 But someone must be buying these luxurious things or else why would a mall like this be open? 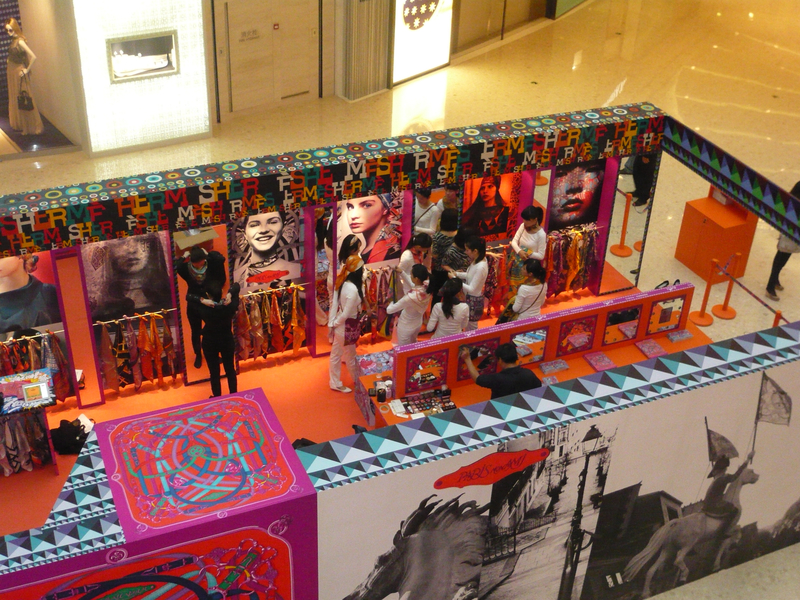 The Chinese models getting their expensive French scarves on. 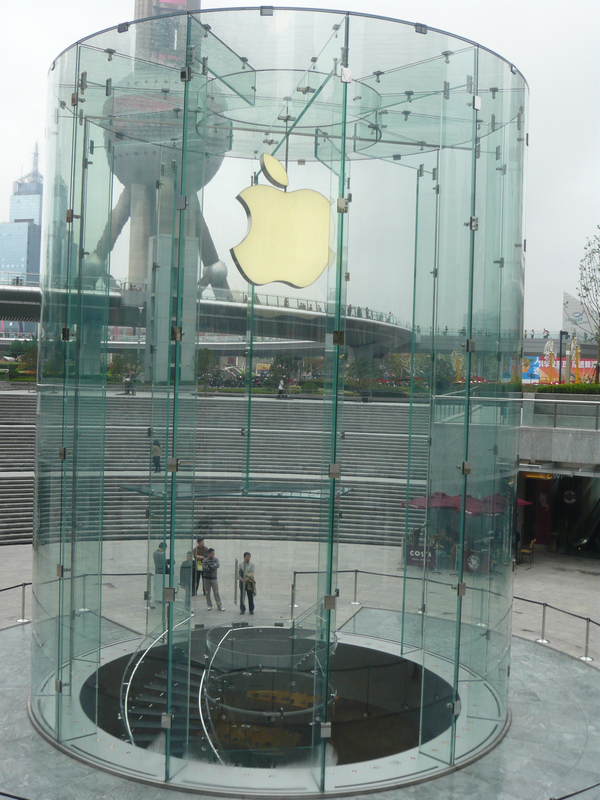 I thought this Apple store was a mighty creative concept! 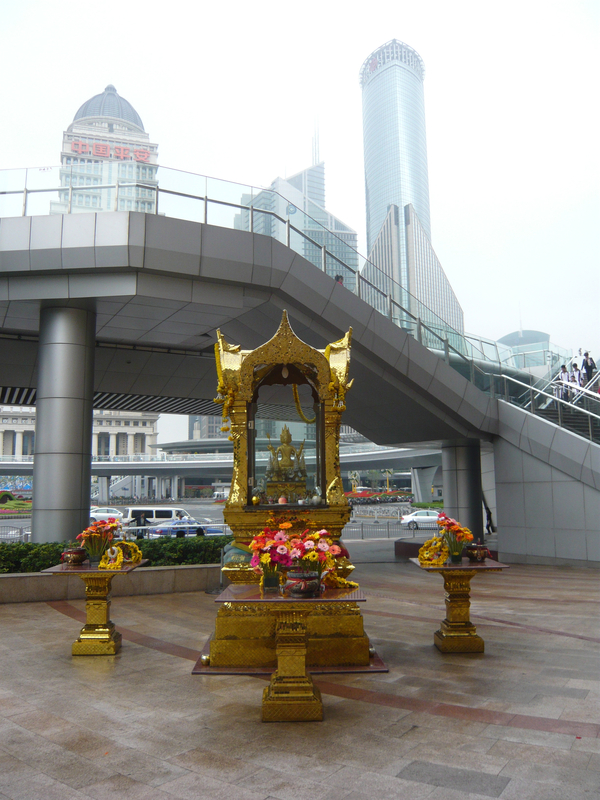 I could hardly find anything traditional in Pudong except I did see this little Buddha. It sure felt out of place in such a concrete jungle. Stay tuned…I have a few more China posts left and then I’ll be moving on to something new. Living with that smog constantly must be awful! I don’t know if I have words for how amazing your photos are. This post should be Freshly Pressed. The fog and smog make the place look completely surreal. And that Apple store is amazing. Great post, my friend! I’m blown away. Wow, that is great! If you have time before you go, I recommend two books on China: Peter Hussler’s Country Driving is fabulous and tells it like is is. I also loved Sheryl WuDunn and Nicolos Kristoffs “China Wakes”. It is a little dates but so right on target and helps explain China from a historical perspective. Make sure you do the Hutongs in Beijing. That was my favorite part. Also go for the less touristy part of the wall if you can. As for Shanghai, I enjoyed the water village (we went ourselves one day and I haven’t written the post yet) and it is great if you can stay on The Bund. A must is LOST HEAVEN…the most delicious food we had on the entire trip and we ate their twice because it was so incredibly good. China is definitely a different type of place. It wasn’t the most relaxing or rewarding. YET, in terms of what I learned and saw, if you go in there with an open mind and just take it all in, you will be fascinated by it. I am so glad I went! The river cruise sounds incredible. I would have loved to do that. Anyway, I can’t wait to hear more about it! Thanks for letting me know and if you have any questions about our experiences, let me know. Yes, the itinerary includes the Hutong’s in Beijing. The trip is with AAAS & Sigma Xi so I am sure we will get a very good history lesson . The trip is lead by Dr. Chris Carpenter, who has been leading China trips for 17 years. We won’t get to chose our section of the Great Wall, we will be going to the Mutianyu section. Most of the itinerary is set so I don’t think we will get a lot of free time to do our own thing. But is we have time I will to make it to LOST HEAVEN. I will also check out the two books, thanks for the recommendation.